Life has been a bit hectic of late. Many months ago I received an email suggesting I have an Australian by the name of Squatter Coffey on the show. As I do with all your suggestions, I try to contact the person and see if they want to be on the show. Squatter did agree to come on the show, but we couldn’t find a convenient time. You see, Squatter Coffey lives way out in a “rural” area of Australia. The time difference would have one of us up in the middle of the night. We agreed that we would get together when his season changed. 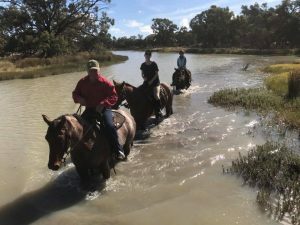 It’s just now turning spring in Australia and Squatter, who owns and operates a bush trail riding company, is entering his good riding season. 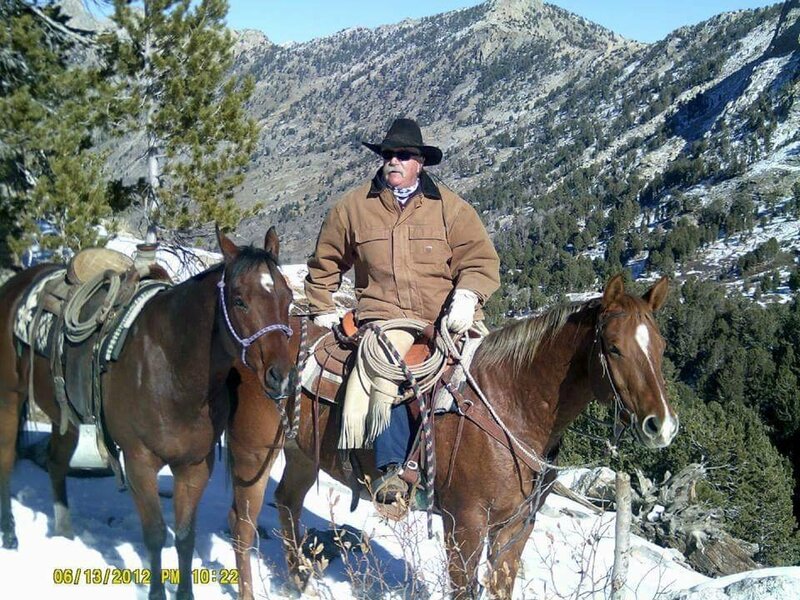 Squatter Coffey has been riding horses so long he doesn’t remember “learning” how to ride. He has just always ridden. Squatter grew up in a family of horses. His 6 siblings are all in the horse business. 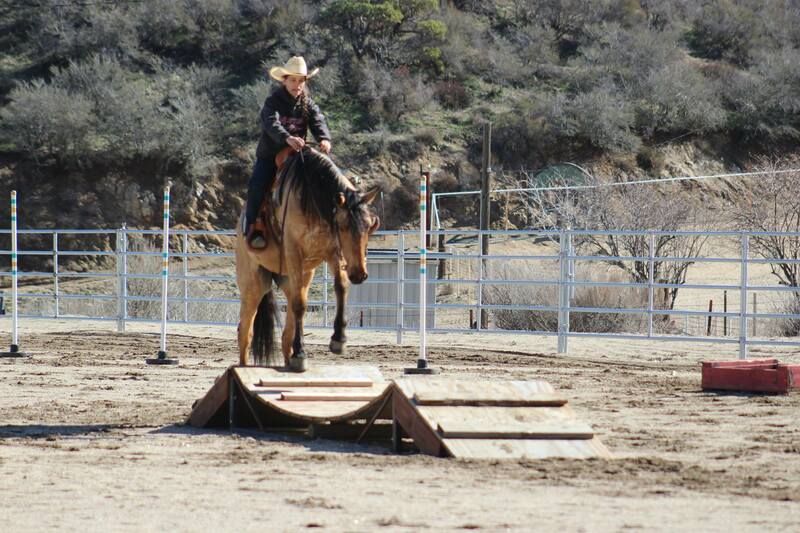 Squatter raced horse, worked on stations and has done just about everything you can do on a horse. While it’s sometimes difficult to find something to talk about, Squatter and I share a common love of horses and horsemanship. He has some good stories and he shares his experiences on the show. I hope you enjoy Squatter Coffey. We have well over 200 episodes up now and you can find them all for free on iTunes, with our Android App in the Amazon store, and now Stitcher, or wherever podcasts are distributed. Get the Stitcher app and tell us how it works. We are on Google Play too! You can also find every episode and more about the show at whoapodcast.com. Please take a moment and join our email list. Get in on the conversation with Facebook and Twitter and Instagram– just look for WhoaPodcast. Support the Whoa Podcast with this Amazon Link. 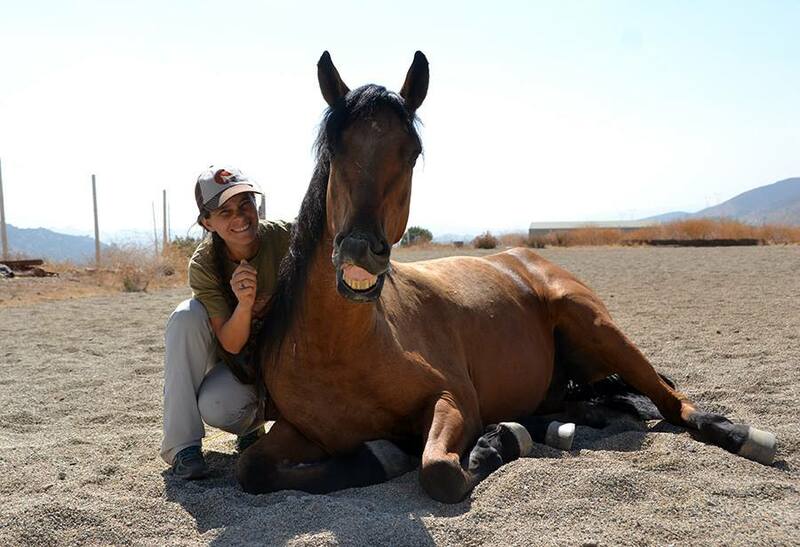 We first met Adriane DeWolfe at a playday with fellow Downunder Horsemanship friends. it was great getting together with like-minded people to work on our collective horsemanship skills. Adriane was there with her horse Toaster, a mustang. Ranae had brought Dusty and I was working with Scratch. It was clear that Adriane was a serious horsewoman. She worked equally hard on both technique and philosophy. Toaster responded well. Later, we learned it was her first time out with Toaster. While we continued to follow each other on Facebook, it would be some months before we saw Adriane DeWolfe again. Ranae and I thought we would try our hand at Extreme Cowboy Racing. There was a race being held about a 90-minute drive away at Shades of Gold Ranch. Adriane and Toaster were entered in the novice division. When they took the course we saw they had come a long way in a very short time. 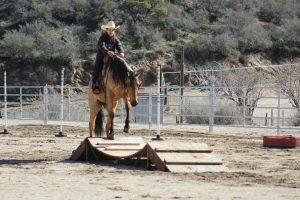 Adriane kept challenging herself and her horsemanship to get better. It was always a smooth trail. There were many ups and downs. 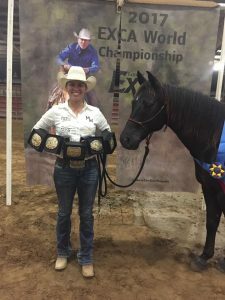 In 2018, she continued Extreme Cowboy Racing and qualified for the National Competition in Glen Rose, Texas. She and Toaster will compete in November of 2018. On the course with Toaster. Adriane DeWolfe bid and won Toaster at the Northern Nevada Correctional Center Wild Horse Training Facility auction. And, her journey to Glen Rose when she pulls into the arena for the EXCA National Finals, has been a long one. 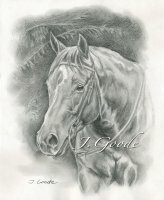 It’s an inspiration to all recreational horsemen and women. With a little dedication, a lot of hard work, and the love of a good horse, you can reach your goals. 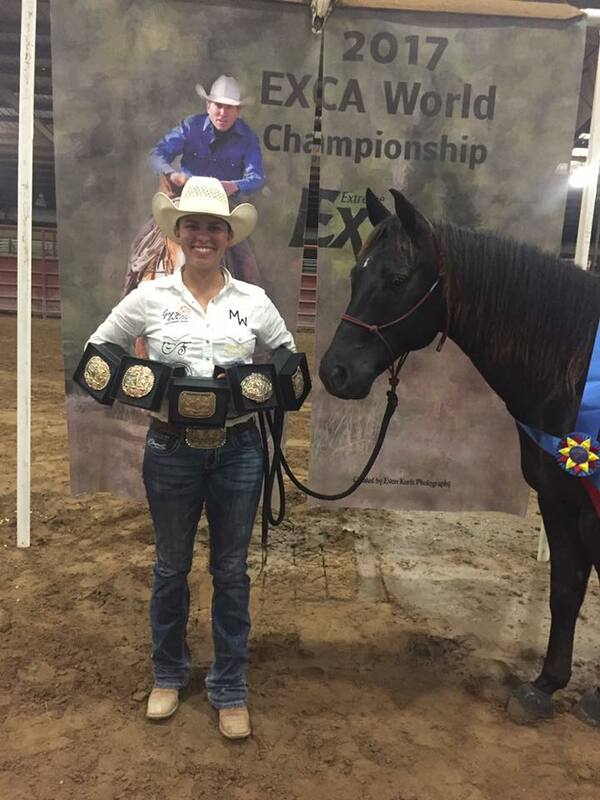 I first learned of Magen Warlick when I was a member of Clinton Anderson’s Downunder Horsemanship No Worries Club (NWC). Clinton has an Academy that trains horsemen and women in his Downunder Horsemanship Method. It’s a tough deal and only a few make it to the end. Magen was one of those few. After nearly 10 years as an NWC member, I dropped out and lost track of many of the Downunder folks. Earlier this year, if you’ve been following along the podcast, Ranae and I participated in several California Extreme Cowboy Race Events. We met a lot of nice folks and a few we competed with made it to the National Finals in Texas. As we followed along with that event online, we noticed Magen Warlick’s name in the Futurity and Professional Division. It was a grueling week of competition and Magen came out on top. Because of our interest in EXCA I wanted to have Magen Warlick on the show to talk about her experience. I also wanted to know if she could give us a few tips on how to better compete with our horses. She came through on both counts. Have a problem with your horse? Do you have a favorite trainer you would like to hear from? Send us your question and the name of your favorite trainer and we’ll see if we can contact them and get you an answer. Email John@whoapodcast.com or call on our message line (661) 368-5530 (toll charges may apply). There is a “Join Our Email” list at the top of this page. Sign up. Occasionally, I’ll send you something useful you can use to build a better relationship with your horse. Thanks! We have well over 100 episodes up now and you can find them all for free on iTunes, with our Android App in the Amazon store, and now Stitcher, or wherever podcasts are distributed. Get the Stitcher app and tell us how it works. We are on Google Play too! You can also find every episode and more about the show at whoapodcast.com. Please take a moment and join our email list. Get in on the conversation with Facebook and Twitter and Instagram– just look for WhoaPodcast. The Wreck at Trout Creek with Skeeter and Bill by Bill Mooney. Bill Mooney buckaroo’d on the Spanish Ranch for 4 years, I believe, in the 1970’s. The Spanish Ranch, part of the Ellison, was a big outfit, running to a million and a half acres. Being a buckaroo can be tough work. You ride many different horses and there is a wide variety of work to do. Most days are spent horseback. As a matter of fact, Bill once wrote that he mounted a horse 320 days one year. To learn more about Bill’s career as a cowboy, listen to our first podcast with him. As with many cowboys, there is a favorite horse, or a favorite story, or even a favorite boss. Bill Mooney had all these and a whole lot more. In the episode of Tales from the Moon Man (My nickname for this series – I just made it up right now. Pretty quick aren’t I? ), Bill tells the story of the Wreck at Trout Creek with Skeeter and Bill. Long-time listeners will notice I’ve added a little music for dramatic effect. It would be great to have your input on how you feel it adds or detracts from the story. If you enjoyed this story and want to read more from Bill Mooney, follow him on Facebook. I guarantee it’s a good read. 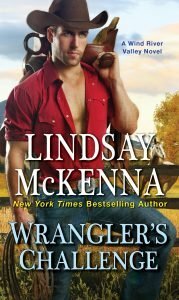 Wranglers Challenge is Lindsay McKenna’s new book . As a writer, Lindsay McKenna created a whole new genre called Military Adventure Romance. We wanted to do something this year to raise awareness and support for veterans. As a veteran, Lindsay McKenna knows many of the struggles veterans face after their service. And, she is quite aware that there are many forms of PTSD. Most of you know I listen to quite a few books on Audible. Lindsay has several there (Lindsay McKenna has written over 200 books and sold over 23 MILLION copies worldwide!). Almost all the ratings were 4 and 5 stars. Many of Lindsay’s book deal with veterans and their reintegration back into society after their military service. We talk much more than her new book, Wranglers Challenge. Lindsay has an amazing life and she tells many tales of her experiences including those with horses.